North and South Korean officials inspected work to ease tension on their militarized border on Wednesday, checking on the demolition of bunkers and probing for secret tunnels, despite scant progress on persuading the North to give up nuclear arms. The two sides destroyed 11 guard posts within 1 km (0.6 mile) of each side of the heavily fortified border and withdrew equipment and personnel late last month, as a first step in a military pact reached in September between South Korean President Moon Jae-in and North Korean leader Kim Jong Un. “Our verification team brought stethoscope-like equipment to see if there were underground tunnels, but the North side did not stop them nor express discomfort and actively cooperated,” Moon’s spokesman, Kim Eui-kyeom, told a news briefing. A year ago, such a joint operation by some 77 officials from the two sides would have been unthinkable. North Korea’s repeated missile tests and its sixth and most powerful nuclear test in September 2017, in defiance of U.N. and U.S. warnings, had stirred fears of war. But things have changed at a head-spinning pace over the past 12 months. In a New Year message last year, Kim extended an olive branch to old enemy South Korea, then sent a team to the Winter Olympics there in February, and held three summits with Moon over the course of the year. Kim also met President Donald Trump for an unprecedented summit in Singapore in June. Moon said the removal of the border guard posts and Wednesday’s two-way verification exercise marked a “new milestone” in the 65-year division of the peninsula. 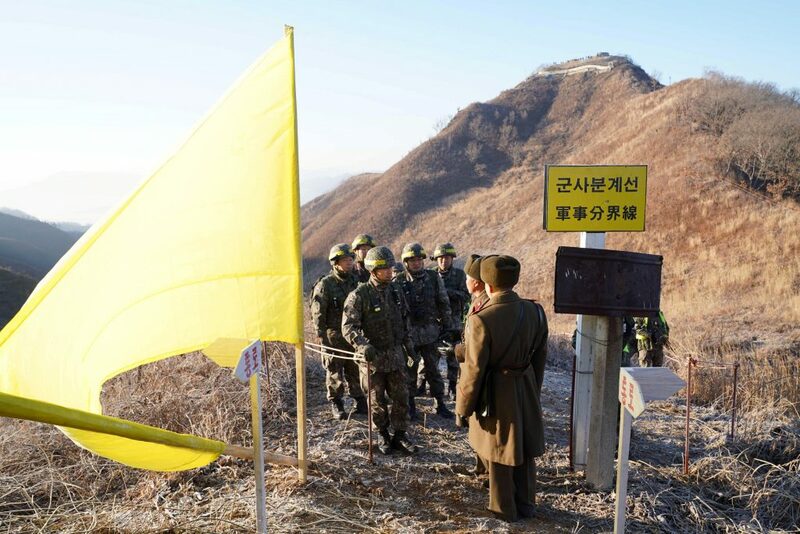 “It’s something we couldn’t even imagine in the past that the South and the North build trails in the Demilitarized Zone where they confronted each other, and pull out the guard posts and transparently verify it,” Moon told aides after watching a broadcast of the inspection. Live video footage showed soldiers equipped with telescopes and other equipment gathered at the Military Demarcation Line, then crossing the border together to visit the demolished posts on both sides. The soldiers checked that all firearms, personnel and lookout posts were removed, and tunnels and other facilities destroyed, the South’s Defense Ministry said. The atmosphere was “cordial” and soldiers chatted and shared cigarettes, Moon’s spokesman said. North and South Korea are technically still at war because the 1950-53 Korean War ended in a truce, not a peace treaty. Kim and Trump vowed in their June talks in Singapore to work toward denuclearization, but they have made little progress.